Bad breath isn't normal and is usually a sign that your cat or dog has dental disease. Dental woes are more than just a toothache; they can also pose a serious threat to your pet’s well-being. That is because the condition of your pet’s teeth and gums can directly affect her overall health. Read on to learn about the top four signs of poor dental hygiene and the best ways to combat them. How often have you gotten eye to eye with a furry friend only to be put off by her breath? We usually explain away a pet’s bad breath as simply being “dog breath” or “cat breath,” as if it is a normal part of her being. However, unless your pet has just eaten something stinky such as tuna, it is important to recognize that bad breath is not normal and can indicate a problem with her dental health. 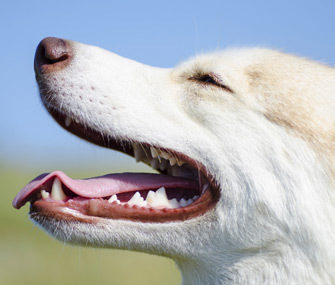 Healthy canine and feline teeth are white. Any discolorations or stains should be examined by your veterinary team. In addition, buildup or darker areas on your pet’s teeth, particularly around the gumline, is another sign that something isn’t right with her dental health. Healthy gums are pink (although some breeds have pigmented gums). Gums that are red and swollen or are bleeding need attention. Unless your pet’s jaw has been injured, loose teeth can be an indication of bone loss. You can determine if teeth are loose by gently pressing on them. But do so carefully, as this can be painful and even the most docile pet may bite. All of the above problems can be signs of periodontal disease, a disease that attacks the gums and teeth and can cause potentially life-threatening infections. Here is how it happens: Plaque builds up on your pet’s teeth. If it is not brushed away within 24 to 36 hours, it hardens into a yellow or brown substance called tartar, which can be removed only by a veterinarian (ideally, while the pet is under anesthesia). Over time, tartar that remains on your pet’s teeth also builds up under the gums. Tartar and bacteria eventually separate the gums from the teeth, forming gaps or pockets that encourage even more bacterial growth. At later stages of the disease, surgery may be needed to repair the damage, and affected teeth may need to be pulled. Have your pet’s teeth cleaned professionally by your veterinarian on a regular basis. Brush your pet’s teeth daily to help reduce the buildup of plaque. Pay attention to your pet’s dental health. Check on her teeth and her gums regularly.